The Alpine Chamber of Commerce invites you to participate in our exciting new Spring Festival event! Alpine is celebrating Spring with arts, Crafts and Music on Saturday, April 13, 2019 at the Alpine Community Center ( 1830 Alpine Blvd.)! Let your individuality shine as a vendor, musician or display artist at this first ever event. We are planning an indoor display of local artists’ work, as well a park full of vendors and music for everyone to enjoy, while having the choice of local food fare and a hopping beer garden! This will be Alpine’s cultural jubilation! Vendor spots are $40. 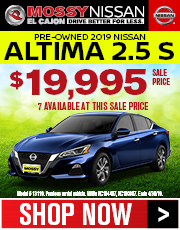 For more information please call The Alpine Chamber of Commerce at 619-445-2722 or email info@alpinechamber.com or visit our webpage, www.alpinechamber.com. It’s Time to Elect Alpine’s 2019 Honorary Mayor! Could it be YOU? 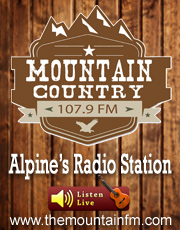 Do you have a favorite charity or good cause to help improve Alpine and/or its citizens? 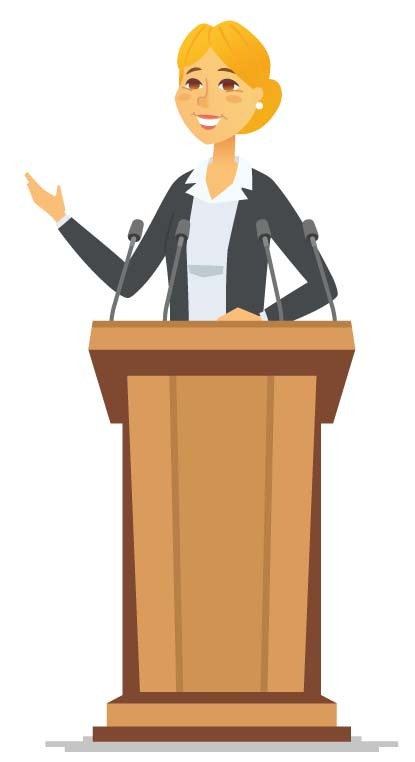 If so, enter the 2019 Alpine Honorary Mayor’s Race and raise money for your cause! The Alpine Chamber of Commerce holds the annual competition to raise money for nonprofit community causes. Every dollar donated to a candidate’s campaign is a “vote”. The candidates with the most “votes” wins! Each candidate, who must live or work in Alpine, gives the money he or she raises to their nonprofit charity, organization, community enhancement project, or educational purpose of choice. The title of Honorary Mayor comes with some responsibilities, but no real authority. The Honorary Mayor attends local ribbon cuttings, Chamber events, and parades.Please “file” your intention to serve as Alpine’s community Ambassador with the Alpine Chamber of Commerce by completing the “candidate filing” (See form here). Guidelines and rules: Any adult 18 years or older is eligible to run. Candidate must live or work in Alpine.Selected charities/causes/projects must directly serve the Alpine community.A vote is one dollar. Voters can vote as often and as much as they wish. The candidate with the most “dollars” wins. Soroptimist International of Alpine made it official on Feb. 5 by awarding Duffell a major share of $2,700 handed out in the organization’s 2019 “Live Your Dream Awards” program. 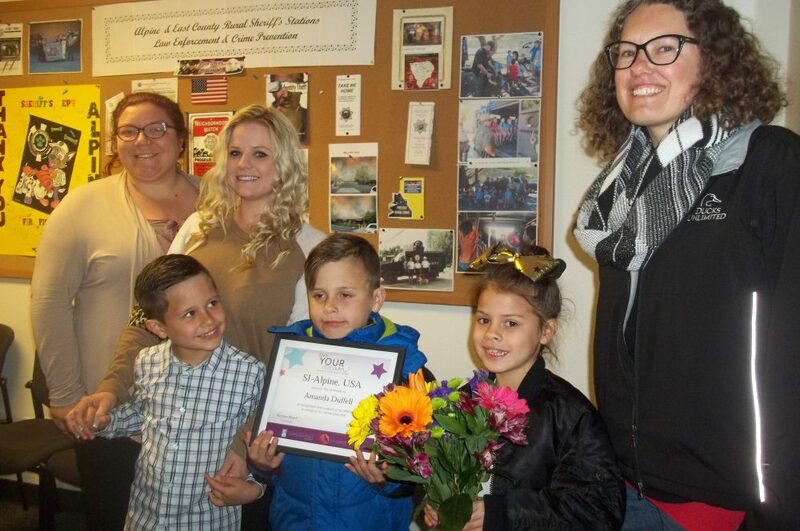 Duffell’s three young children applauded their mom as she accepted flowers and praise in the Community Room of the Alpine Sheriff’s Station at 2751 Alpine Blvd. “When I sent in the application I didn’t think I had a chance,” said Duffell, 30, of Alpine. “It’s amazing. It’s incredible.” Now working in an East San Diego County doughnut shop while attending San Diego City College, Duffel had earlier accepted her Soroptimist award grant so she could catch up on her bills. The “Live Your Dream Awards” help women who are the primary financial support for their families by giving them necessary resources to improve their education, skills and employment prospects. Every year Soroptimist International groups overall invest more than $2 million in education grants to almost 1,500 women. Duffell turned her life around, she’s working hard and she’s going to college while making sure her children are in a good school, Pinard said. “The award’s not just about her hardships,” she said. “It’s also about the fact that she has a very clear career goal and she’s on that path.” As her two sons and daughter ages 6, 8 and 9, finished their refreshments, Duffle briefly quietly talked about her troubled early years. “It started when I was about their age,” she said. “I was taken away from my mom and put into the foster care system.” When she was 13, she continued, she moved to Mexico on her own to find her mother in Tijuana. She was able to contact her mom, Duffell said, but life in Mexico turned “horrible.” “When I was 22 years old, I was diagnosed with a chronic disease,” she said. “My oldest son was sick, too. It was hard. I was pregnant. My daughter was in foster care. My son was in Mexico. I didn’t have any family or friends.” Duffell reached out to a medical social worker in San Diego. Social workers at the University of California San Diego then helped her get into rehabilitation, she said. They “gave me faith that I was worth it,” Duffell said, adding that she never wants her children to go through what she did. 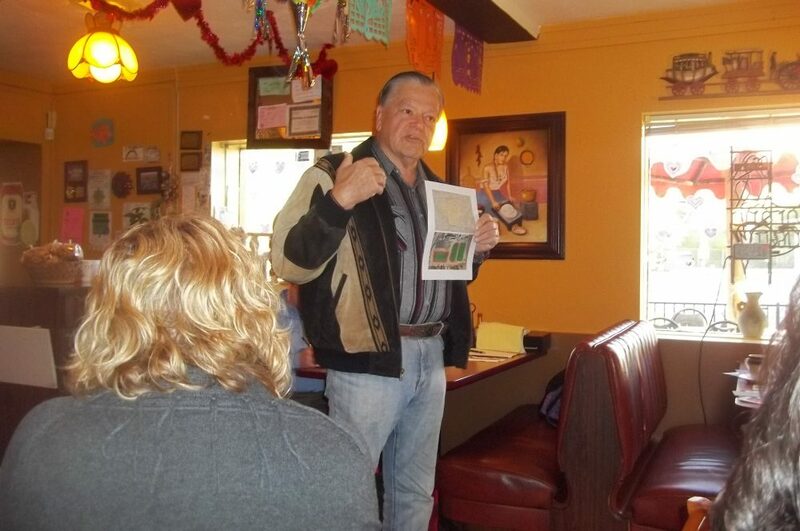 The goal of a San Diego County Park in Alpine appeared to be closer to reality at the latest Hot Topics” breakfast of the Alpine Chamber of Commerce. He said the proposed park along South Grade Road is undergoing an environmental assessment for possible uses. The land abuts the Wright’s Field preserve owned by BCLT in the center of Alpine. A companion project is the development of playing fields at nearby Joan MacQueen Middle School at 2001 Tavern Road. “A benefactor in Alpine has agreed to fund a water well and irrigation infrastructure and on-going maintenance for the middle school playing fields,” Barnett said, That impressed the Chamber members and guests, who listened carefully as the speaker noted that the Alpine Education Foundation has applied for neighborhood reinvestment grants to help the middle school project. Barnett said the $900,000 would come from the county’s parkland development account, funded by developers’ fees. Jon Green, BCLT’s program and outreach director, spoke in support of the proposed park. Green also encouraged everyone to continue treating 230-acre Wright’s Field preserve —- which shares history with the Kumeyaay Indians, the Spaniards who came here and the homesteaders —- as precious ground. “We all value Wright’s Field,” Green said. “It is as close as we can get to having sacred ground in this county.” Noting that Wright’s Field has many kinds of animals and plants, Barnett said the park land assessment needs to be thorough “because this is a very rare environment.” “How many towns in the world are going to have 300 acres of park land right in their middle?” he added. In other business, Chamber Executive Director Alex Ward talked about new Chamber opportunities and activities. 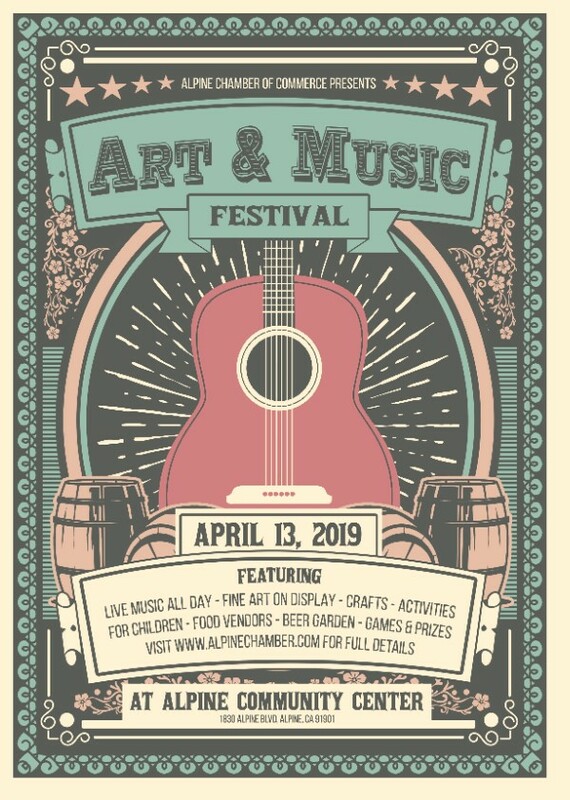 A major new event is the free Spring Art & Music Festival on Saturday, April 13, at the Alpine Community Center at 1830 Alpine Blvd. Vendors will be welcome. “We’re hoping to have a lot of artists as well as musicians,” Ward said. 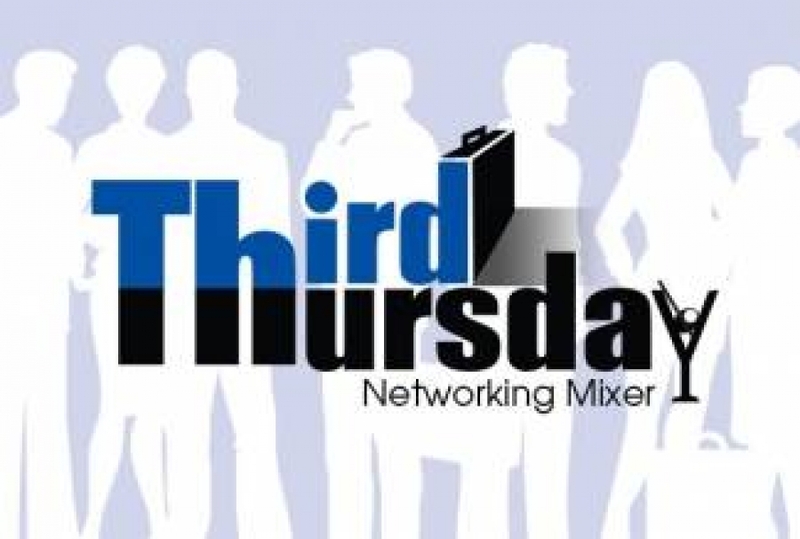 Please join the Alpine Chamber of Commerce “Third Thursday Mixer” on Feb. 21, 2019 at Mediterraneo’s Bistro Bar & Grill in Alpine! Greet old friends, make new ones, network and enjoy the fun from 6-8 p.m. in the Alpine Creek Town Center at 1347 Tavern Road. There’s a no-host bar. The monthly event is free for members who make the required reservations or $10 per person for walk-ins and non-Chamber members. Space is limited! Please e-mail or call the Chamber now at info@alpinechamber.com or (619) 445-2722. 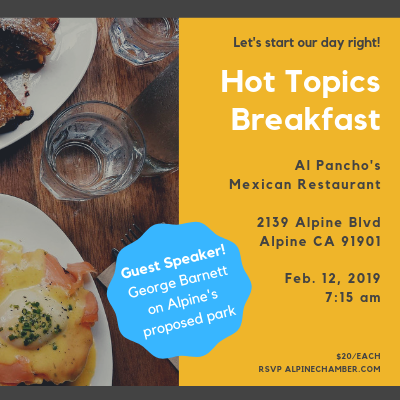 Find out more about the proposal for a 98-acre San Diego County park in Alpine during the Chamber’s next monthly “Hot Topics” business breakfast! The friendly way to start the day at 7:15 a.m. on Tuesday, Feb. 12, will be at Al Pancho’s Mexican Restaurant at 2139 Alpine Blvd. Vice President George Barnett of the Back Country Land Trust (BCLT) will talk about proposed plans for an Alpine County Community Park that would be adjacent to Wright’s Field. BCLT owns and maintains the field preserve. Barnett’s talk is timely, because the next day on Feb. 13 the San Diego County Board of Supervisors will hold a hearing about buying the proposed park land and maintaining it. Chamber members and guests will get more news about the community as well as activities and opportunities as they enjoy the hot breakfast. The $20 cost includes giveaways! Reservations are requested. Call the Chamber at (619) 445-2722 or visit www.alpinechamber.com to get details and to reserve your spot! Can’t make an early morning breakfast meeting? Then come to the Alpine Chamber’s free Third Thursday Mixer from 6 to 8 p.m. on Feb. 21 at Mediterraneo Italian Bistro & Bar! Known for its gorgeous views as well as delicious appetizers and beverages, Mediterraneo’s is in the Alpine Creek Town Center at 1347 Tavern Road. There will be networking and fun for Chamber members and guests as well as a no-host bar. 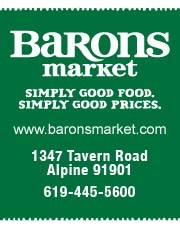 Make your reservation now by calling the Chamber at (619) 445-2722 or visiting www.alpinechamber.com! Alpine’s leaders, business people, organization representatives, agencies, residents and county staff also discussed the latest news about road paving, local signage and other needs. The county supervisor said the park proposal, which will be discussed at the county board’s Feb. 13 meeting, is “definitely a priority.” Final board approval is needed to buy 98 acres of land abutting the Wright’s Field preserve, which is owned and maintained by the Back Country Land Trust (BCLT). BCLT Vice President George Barnett said it was “absolutely wonderful” to hear Jacob speak enthusiastically about the county buying the balance of Wright’s Field and intending to use it for community access. He said it was also good to hear her fully support the proposed upgrade of sports playing fields at Joan MacQueen Middle School, because both projects benefit Alpine. Almost everyone leaned forward to hear Travis Lyon, an Alpine Union School District (AUSD) board member, talk about the latest effort to get a high school in Alpine. A partnership between the Alpine Chamber of Commerce and BCLT to beautify Alpine Boulevard is trying to work with county permit and insurance requirements in order to pursue the project, Chamber Executive Director Alex Ward and Jon Green, BCLT outreach and program director, told Jacob. “You’re doing great work,” she replied after encouraging them to work with county personnel and to contact her office if that didn’t work out. Mary Kay Borchard, a volunteer community representative with the revitalization committee, said she thought the meeting was positive for Alpine’s development. 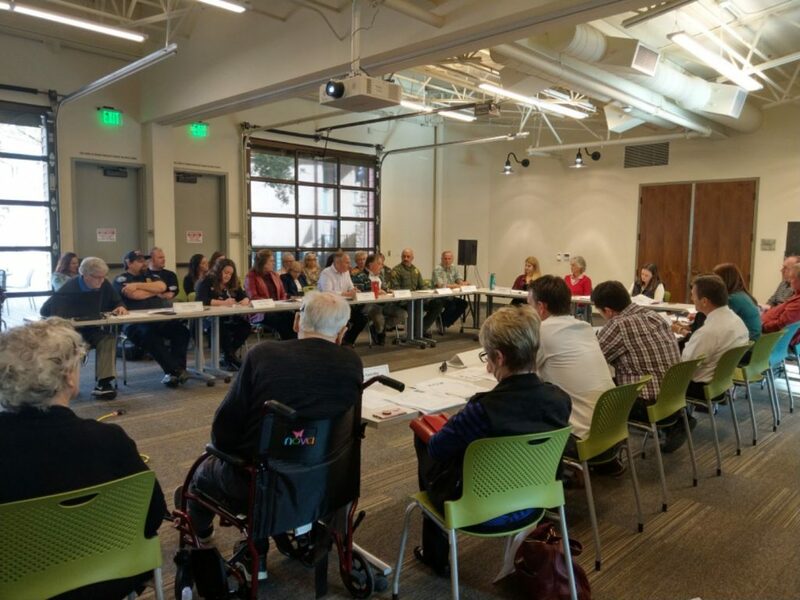 “I would invite and encourage any interested resident to attend the next Alpine revitalization meeting on June 27, 2 to 4 p.m., at the Alpine Library,” Borchard said. 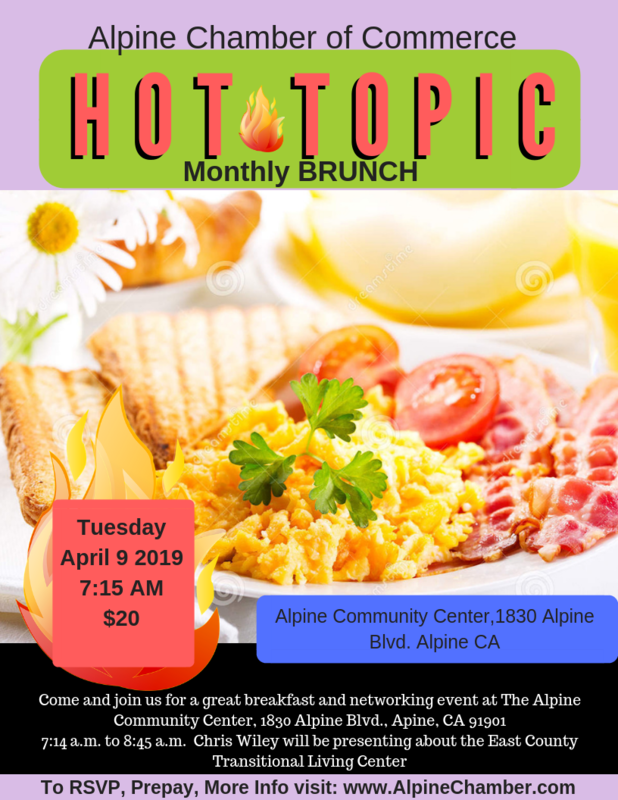 The Alpine Mountain Empire Chamber of Commerce welcomes you to join us at our first Hot Topics Networking Breakfast of 2019! We will be at the Greek Village Grill (1730 Alpine Blvd. 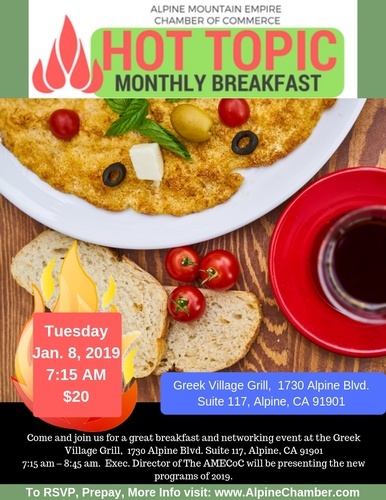 Suite 117, Alpine, CA 91901) on January 8, 2019, at 7:15 a.m. to 8:45 a.m. Cost is $20. Please come by to learn about what the Chamber is planning for 2019, including our Third Thursday Mixers, (the first one of 2019 will be at La Carreta Mexican Restaurant, on Jan. 17, at 6 p.m.) and our Wednesday Workshops! We will also be covering our 2019 calendar of events. 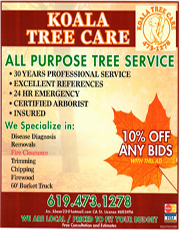 For more info please contact Lori Bledsoe at The Alpine Mountain Empire Chamber of Commerce at 619. 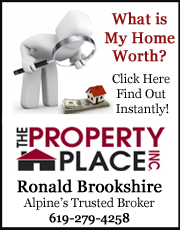 445.2722 or email lorib@alpinechamber.com. 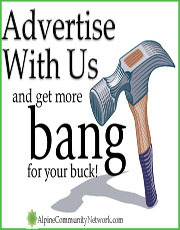 Visit our website at alpinechamber.com. 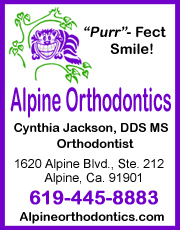 The Alpine Chamber of Commerce is located at 1620 Alpine Blvd., Ste. #208, Alpine Ca 91901.